EBC Copy | I Don't Stink! Your Christmas cards this year could include a certificate that you have donated a children’s book to a child in need on someone’s behalf. And we can do that for you, for just a few dollars a book you can help underprivileged children access to age appropriate reading. Whether or not a child reads well by grade 4 can be used to predict the rest of his or her life. When the State of Arizona projects how many prison beds it will need in the future by factoring in kids’ reading ability in the fourth grade. This is because statistics prove over and over again that two-thirds of the children in the fourth grade who cannot read proficiently by the end of that school year will ultimately end up in jail or on welfare. Wow! These horrible trends are not just in confined to Arizona. We are seeing similar situations across Canada and the US. It is also a common know fact that children with weak literacy and math skills end up dropping out of school at alarming rates. Research has shown that this trend is costing our society hundreds of billions of dollars each year when you factor in lost revenue, lost earnings as well as the social service expenses due to these dropouts. What is amazing is that this doesn’t even factor in the opportunity cost if some of these students were actually contributing productive individuals when they graduate high school and are successful. One of the easiest problems we can solve is get books into the hands of the underprivileged children. The fact that low-income children have on average about one age appropriate book per 300 children should be enough. However, when you compare it those statistics to that of middle-income children, you really see the gap. That is because these children have about 13 books per child. Seriously, is this trend acceptable? The children’s authors of the EBC (Evolutionary Business Council) think not! They are taking a stance on this issue by offering you the opportunity to give books at production cost to appropriate children’s organizations to get books into these children’s hands. Step 1: Scroll down below and select from the list of books that are available. Step 3: Select the book or books by adding to the shopping cart. Step 6: Receive several PDF cards that you can give out as Holiday gifts. You simply print them off and hand out as gifts. Description: What would happen if Negative Thoughts and Actions smelled bad? If they STANK? Would we notice them more? Would we be less inclined to indulge in them? 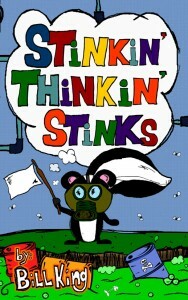 Attributing bad smells to our various negative thoughts, actions, and attitudes, young readers and their older friends are given techniques to recognize, deal with, and mitigate the negativity that holds so many of us back. 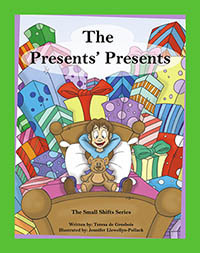 Description: The Presents’ Presents is a true compelling story of small Rae, who makes the shift from wanting more and more presents to understanding that happiness that comes from “wanting” or “having” is not a lasting happiness. Rae and her friends learn that giving and feeling connected to others brings them more joy. Read by book characters Rae and Fiona Fox. 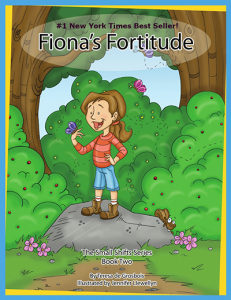 Description: Commissioned by Unicef Canada in celebration of the 20th Anniversary of the United Nations Convention on the Rights of the Child, this Fiona’s Fortitude weaves the adventure of small Fiona, who is very good at doing hard things. Fiona’s choice to put aside her fear in a tough moment, helps her whole family deal with a dangerous situation. This illustrated children’s book for ages 3 to 8 teaches the Law of Attraction principle to focus on where you want to go, and not on what you are afraid of. 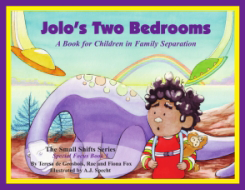 Description: A specialty book in the Small Shifts Series for children ages 4 to 8, Jolo’s Two Bedrooms weaves the story of a small boy learning to adjust to his parents’ separation. Description: When Toby steps into the path of a dog who bullies him and shreds his beloved stuffed teddy-bear toy, feelings get hurt. This beautifully illustrated book teaches children about the importance of kindness, respect, acceptance and being considerate of others, including pets. This is a great book for children ages 3 to 9. The book includes interactive questions and activities that parents, teachers and caregivers can use with children. This book was a recipient of the Mom’s Choice Awards, and the Parent Tested Parent Approved Award, as well as a Gold winner with Reader’s Favorite Awards. Description: Toby is a big, brown, happy dog. Every week, his owner, Miss Charmaine takes him to visit and comfort children who are in the hospital. Follow Toby the service dog for a day, and see how he makes friends with the children, helps make them happy and forget that they are sick and away from home. 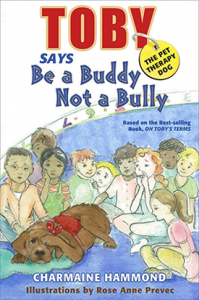 * Beautifully illustrated, Toby, the Pet Therapy Dog teaches young readers the wonders of being of service to others. 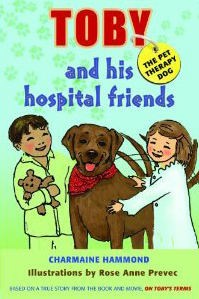 * A happy story that also sends a positive message about community, as well as the importance of kindness to pets. This book was a recipient of the Mom’s Choice Awards. What Love Is A-Z (Softcover) PLUS a Bear! 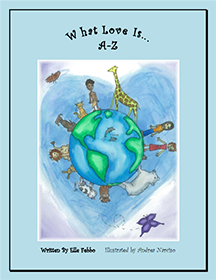 Description: A colorful and inspiring journey through the ABC’s of Love. Price to donate to charity: Book (see left) & Bear Gift Package 8.00 ea unit (cost for minimum of 5 gift packages = $40.00).